Design Hovie Studios is fully engulfed in the Tuesdays in Ballard campaign. 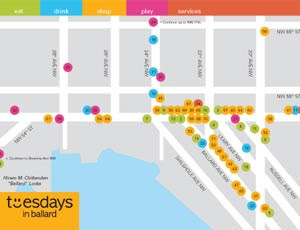 This week we finished up the posters and walking maps and are updating the inballard.com site daily in preparation for the June 23rd kick off event. The map was a great exercise in information design but I feel we made a very full collection (71 businesses) all fit nicely in a pocket sized walking map.